The Mothers’ Union is a worldwide charitable organisation which through its members, aims to support marriage and improve family life in local and global communities. The MU was founded in 1876 by Mary Sumner (a Bishop’s wife and grandmother) whose vision was to unite families of all classes and situations in faith, prayer and mutual support. Today there are 4 million members in 83 countries. What a wonderful tribute to the prayerful mother who saw a need and had the courage to put it into practice. All MU work is underpinned by prayer. All members use the Mothers’ Union Prayer at their meetings and services . Mary Sumner’s personal prayer was to ‘touch as many lives as possible…through the word I speak, the prayer I breathe or the life I live’ Members worldwide are upheld by a daily cycle of prayer. Each diocese is linked with members in other countries who pray for each other on specific days as part of the Wave of Prayer. Although MU members work together to support the worldwide and local projects listed below, an important aspect of our membership is to care for and provide friendship and support for each other within the branch by being a listening ear and sending greeting cards in times of celebration and sadness. 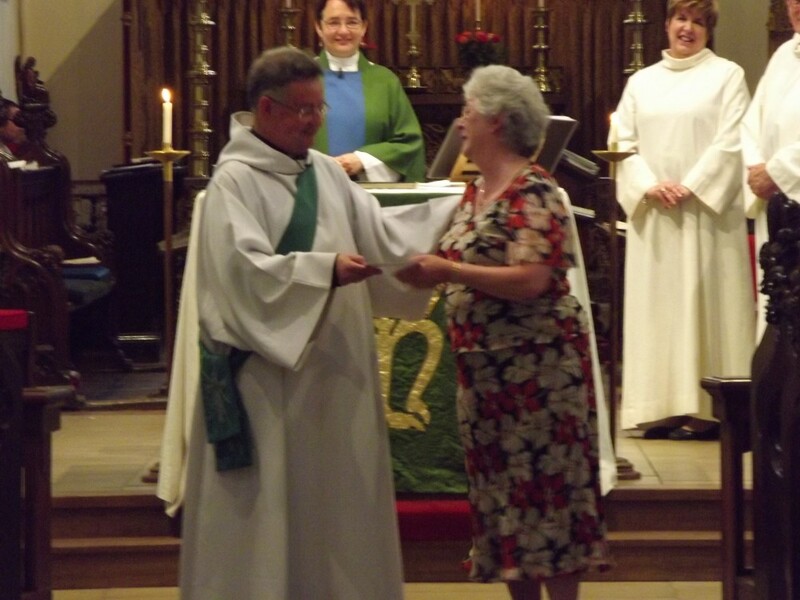 Past Branch Leader, Sylvia Watson receiving her 50 year MU membership certificate from Fr Paul. We meet on the 1st Thursday in the month at 7:30pm in the church hall. In our programme we try to address our faith, reflect on family life, become aware of needs in the local community and have fun! Visitors (men and women) are always welcome at our meetings. All three Branch Leaders since the branch reopened in 2001. From left to right - Catherina Griffiths, Joanne Bowers and Sylvia Watson. 3 Oct: Members Evening: "Sugar and Spice and all things nice"
17 Novemebr : Visiting speaker t.b.a. All meetings on 1st Thursday of the month at 7.30pm in the Church Rooms unless otherwise stated. There are MU Representatives on Consultative committees at the UN with special reference to legislation affecting families. The UK government values the standards and opinions of the MU. Officers from Mary Sumner house are frequently consulted by the Government on national policies relating to family life. At branch level members are often asked to discuss relevant documents before presentation to Parliament. Literacy and Development Programme –Literacy and Numeracy courses in Burundi, Malawi, Sudan and the West Indies have enabled thousands of men and women to be literate and numerate thus improving their status and quality of life. Parenting Groups – aim to improve family relationships, improve the status of women and involve men actively in their role as fathers. Self-help Income Generating Projects – aim to encourage villagers to work together to improve health, sanitation, crop growing and craft projects to provide more income and better prospects for all the families. HIV/AIDS Education – advice and teaching are given by specially trained workers to halt the spread of HIV/AIDS. 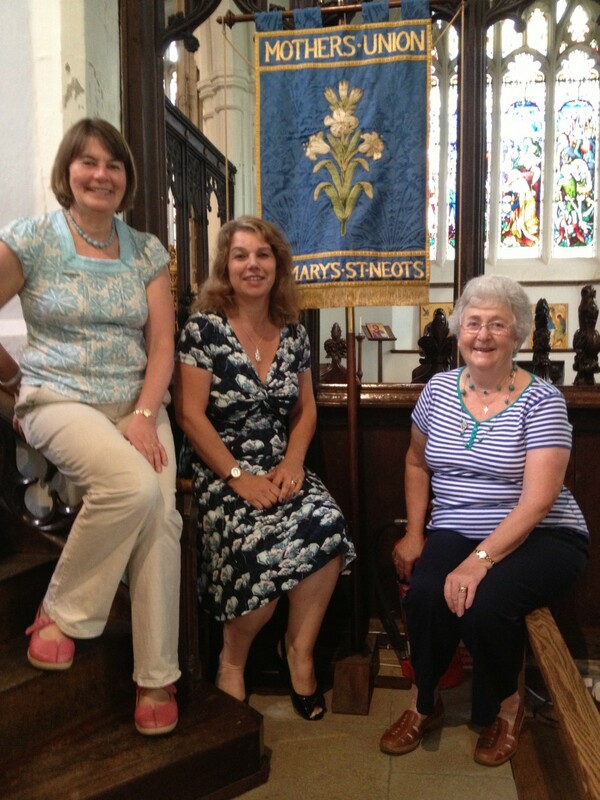 The St. Mary’s St. Neots branch supports the following UK and Ely Diocesan Projects with prayer, goods and financial help. AFIA (Away From It All) - Holidays in a caravan at Hunstanton for families needing a break following stressful situations. Prison Support – Members run Coffee and Chat mornings at HMP Littlehey and share in the Sunday worship in the chapel. Refuges and Hostels – Members provide clothes, toys, household items etc. to support women and children in two refuges and hostels for the homeless in the Diocese. Contact Centres in Ely and Cambridge – Members support this project which provides opportunities for parents who are separated to meet and play with their children in a safe environment. Knitting and Sewing projects – Members knit blankets and clothes for babies in the Neo-natal Unit at Hinchingbrooke Hospital, deprived children in other countries and for any other appeals. Baby Changing & Feeding Tent at Country Shows and other events. In the Parish – we work with our parish priest by offering help with Tots Praise, new outreach initiatives, Baptism Anniversary cards and any other parish needs.